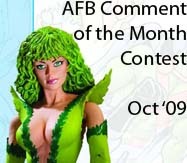 AFB Comment of the Month Contest – October! First off, thanks to everyone who commented on last month’s blog posts. 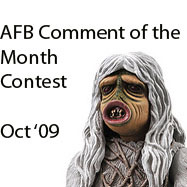 Congratulations to AFB Forum member fishmilkshake for winning the September Comment Contest! 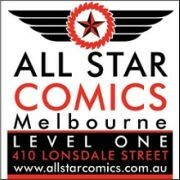 His selected prize of either the DCUC Wave 9 Green Arrow or The DC Direct History of the Universe Black Lightning will be on the way shortly from Mike’s Comics N’ Stuff. Now to October’s Contest: on offer are two great prizes: the winner will be able to choose either from the DC Direct JLI Series Two Fire or the Star Trek: The Original Series Salt Vampire. As well as being great individual figures, these two could be combined together to make an excellent “Before and After Smoking” Set! if my super scientific randomizer comment selector system chooses an Anonymous comment, I’ll skip it and go again – you need to leave a name, a link, your AFB Forum username or email addy so that I can contact you if you are the winner. Blogger comments allows you to do this. figures will be sent by first class mail within the US (Mike is sending them, remember) and first class international to any overseas winner. An overseas winner can elect to chip in for Priority Mail or Insurance, but otherwise we can’t take any responsibility for a parcel that doesn’t arrive – after this is coming out of AFB’s not dreadfully deep pockets! *beams* Thanks AFB and Mike. Congratulations Saranga! I knew you really wanted that Adama figure. By the way Andy, is you super randomizer an unemployed teenager named Greg? If not, consider it, they are way cheaper than other randomizers. Congrats Saranga! That was always going to be a tough choice given it was minimates vs Adama. Congrats on the win, Saranga! Great stuff Saranga. And FS....don't push your luck! Good for you Saranga!BTW FS Greg........er,the Randomizer has no pity function as he's,sorry,it's kept on a chain and only fed Peanut Butter M&Ms with all the chocolate sucked off.Or so i heard. Wow! I've been sick with the flu for the past week and I haven't been able to get on the boards. I'm finally feeling well enough to get back online, and what an awesome surprise that the Comment of the Month contest is two awesome figures! Must have Black Lightning! I better start posting, lol! Second rate heroes, first rate Customs! Marvel Select sinks its teeth into Sabretooth! AFB: Now Braver and Bolder!! !